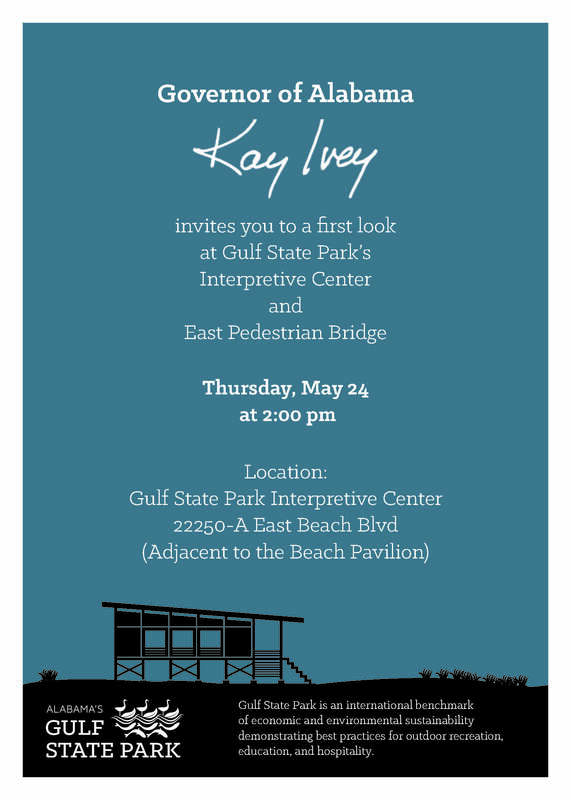 Governor Ivey invites you to a first look at the Interpretive Center and East Pedestrian Bridge on May 24, 2018 at 2:00 pm. Upon completion, the Interpretive Center will welcome everyone to Alabama’s Gulf State Park and invite them to explore the park’s 6,150 acres. This facility is the park’s gateway that introduces visitors to the diverse environment of the Gulf Coast and encourages them to explore the park’s nine distinct ecosystems. With its connection to the park via pedestrian bridge, the Interpretive Center will inspire exploration of the park with interpretive elements and pause places along the park’s 28-mile trail network. Later this summer, interpretive elements will be installed that describe the park’s ecosystems and how the building responds to the Living Building Challenge. The Interpretive Center is pursuing full Living Building certification under the Living Building Challenge, the world’s most demanding building certification. From banning harmful materials and minimizing construction waste to producing more energy than it consumes, fully certified Living Buildings must meet some pretty tough criteria. As of January 2018, there are only 16 fully certified Living Buildings in the world and, if successful, the Interpretive Center will be the first of its kind in the southeast. The Interpretive Center represents the park’s commitment to become an international benchmark of environmental and economic sustainability. The coastal economy is closely tied to a healthy environment. Sustainable facilities, such as the Interpretive Center, being built at Gulf State Park are a model for sustainable tourism. So, please mark your calendar for Thursday, May 24 at 2:00 pm as Governor Ivey introduces these new facilities to the public. To learn more about the Living Building Challenge, watch this video and visit www.living-future.org.